Anyone got any unwanted uniglide sprockets I can replace them as little g as the teeth are not too worn. Copied from Sheldon Browns amazing website. "Sprockets smaller than 14 teeth used a built-in spacer, but the other splined sprockets were reversible, so that if you wore out one side, you could flip them over and the other side was just like new! Alternatively, you can fit Hyperglide sprockets onto a Uniglide body by grinding or filing off the one wide spline. You'll still need a threaded Uniglide sprocket for the top-gear position. 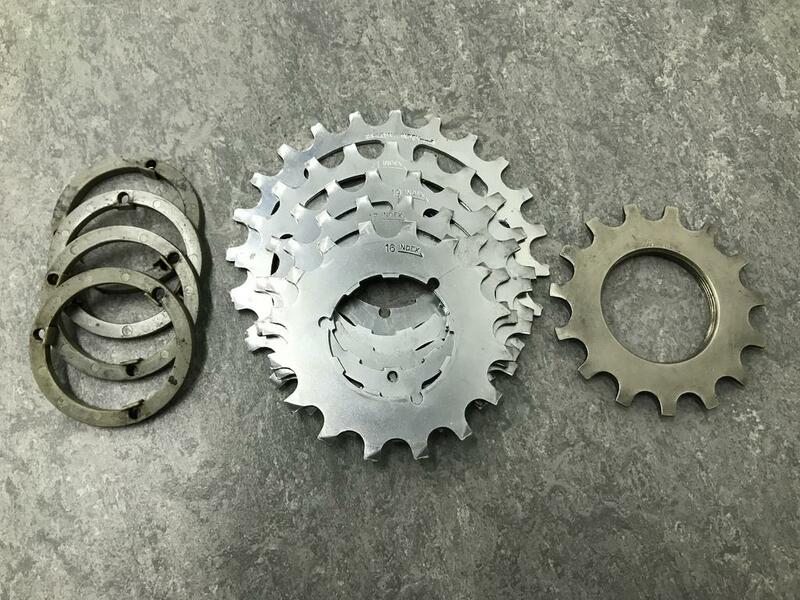 Supplies of these are getting scanty, though it is possible to grind a worn sprocket so it will work with a new chain, or use a 3/32" track sprocket -- the threading is the same, though you may have to grind down the flange or install the sprocket backward and use a spacer." I have done both successfully,swapping the body if the rim has little wear,or modifying it if the rim was getting near to needing replacing. I’ve just upgraded so got two sets up for grabs.